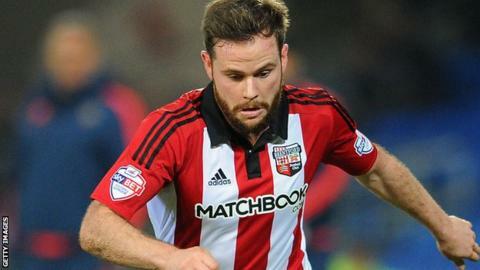 Brentford midfielder Alan Judge has undergone surgery on the broken leg suffered against Ipswich, with no timescale put on his recovery. The 27-year-old Republic of Ireland international was stretchered off following a challenge from Luke Hyam. "I have no doubt Alan will commit fully to returning fitter and stronger," Bees head of medical Neil Greig said. "He will continue to receive support during what is clearly a difficult time for him and his family." Judge has been placed under the care of the leading lower limb consultant in the country, who the west London club say has "unparalleled" experience of managing such injuries. The former Notts County and Blackburn player scored 14 goals in 39 appearances for the Bees this season. He made his international debut for the Republic of Ireland in their friendly against Switzerland last month, but will miss this summer's European Championship in France. Ipswich defender Hyam said he was "distraught" after his tackle led to Judge suffering a fracture in Saturday's match, which Brentford won 3-1.